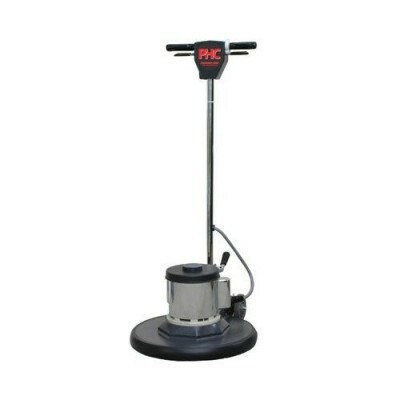 Standard Floor Machine Designed for professional floor care maintenance including stripping, scrubbing, spray buffing, polishing, sanding and grinding on hard floor surfaces, along with shampooing and bonnet cleaning of carpeted floors. They are equipped with cool-running large frame motors 1 and 1.5 horsepower, with all steel planetary gearboxes. Choose from a broad range of sizes to meet specific maintenance requirements. Polished aluminum chassis is chip-resistant and corrosion resistant. Cam style latch allows operator to adjust handle to any comfortable height, using either hand or foot. Aluminum on/off trigger grips resists impacts. Will not break or bend. Three year warranty on motor and gearbox. One year on parts and labor.